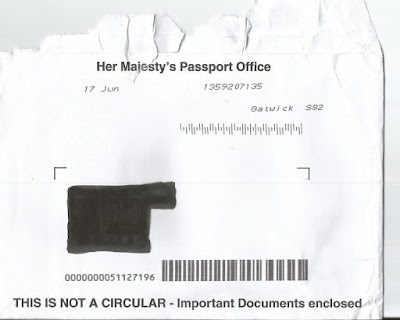 Passport to Temptation: A Nudge in the Wrong Direction from Her Majesty’s Passport Office? One of us Behaviour Workshoppers just renewed our UK passport. The process was smooth and efficient (if expensive). So far, so impressive. The new passport arrived promptly, and included in the envelope was a leaflet entitled "Your new passport: important information." 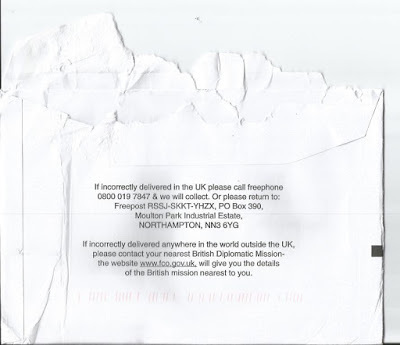 The leaflet includes the following comment "UK passports are valuable documents and criminals attempt to use them to commit crimes which may affect you personally, such as identity theft." Fair enough. We all know that it’s important to safeguard your passport, which is highly sought after by those with nefarious intentions. So why is it that the passport arrives via the post, in an envelope emblazoned with "Her Majesty's Passport Office" and "This Is Not A Circular - Important Documents enclosed." In case there is any doubt as to what the envelope contains, it’s easy to do the Christmas present test, feel the contents and confirm, yes, it’s a passport. If you live in a single dwelling with a private letter box this may not be a security risk (assuming it gets through the postal system), but for people whose post goes to a communal area, it could be a real problem. Given that credit cards and other valuable documents are now sent out in more anonymous packages, why not passports? It’s time to stop this Nudge in the wrong direction. After all, unlike you and me, not everyone out there is an honest and upstanding citizen….and Nudging is all about helping people to do the right thing. Not the wrong thing. At the end of January 1981, the late John Lennon dominated the UK pop music charts with the sadly posthumous Imagine at no. 1 and Woman at no. 2. Adam Ant and Blondie were at no. 4 and no. 5 and we’ll draw a veil over Phil Collins at no. 3. 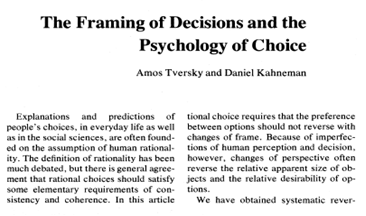 Around the same date, Daniel Kahnemann and Amos Tversky published a paper in Science, The Framing of Decisions and the Psychology of Choice. The paper, now celebrated, demonstrated that people are sensitive to the framing of a decision problem, so that small differences in the presentation of data can have a substantial effect on their decisions. For example, consumers are influenced in their decisions by how choices and options are presented to them. In terms of behavioural economics, it’s clear that framing the same choice in terms of losses instead of gains can alter the decision. Recently, one of us Behaviour Workshoppers was approached with an interesting proposition, namely to record an interview about economics, behavioural economics, behaviour change, nudging and living carfree. So far so good. But rather than “would you like to record an interview on these subjects”, what really captured the attention was the framing – the invitation was to appear as a guest on the Economic Rockstar podcast. Same content, same issues, but what a frame! Impossible to turn it down. So hats off to Frank Conway, the man behind the Economic Rockstar podcast, for a brilliant piece of re-framing: how could anyone with a pulse refuse the invitation? Is it economics? Is it rock and roll? Listen up and decide for yourself – here’s the podcast. Or download the MP3. Meantime, Kahneman (still going) Tversky (sadly, no more), and rock and roll, (staggering on) we salute you! Amos Tversky and Daniel Kahneman, The Framing of Decisions and the Psychology of Choice. Science,New Series, Vol. 211, No. 4481. (Jan. 30, 1981), pp. 453-458.